Missing teeth can take a toll on just about every aspect of your life. Finding a high-quality replacement is important for your continued health and happiness. Dental implants offer a comprehensive solution that does your smile good, and there are also a number of emotional benefits that come with this option as well. We can count 5 at least — learn what they are below. Dental implants replace a missing tooth from the supportive root all the way to the crown that you see. This method results in a replacement that is virtually indistinguishable from the natural teeth around it. And, because implants stabilize the jaw to keep it from losing its volume, they prevent the sunken facial appearance that often accompanies tooth loss. This comprehensive replacement keeps you looking as young as you feel — which can have a serious impact on your emotional health as you get older. 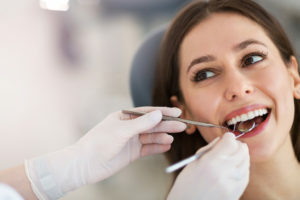 Right after the implants have been placed, you can receive a temporary tooth replacement that will help you eat, speak, and smile with ease until the permanent restoration can be placed on top some months later. That means you won’t have to spend any extra time with missing teeth, worrying about flashing a gap when you smile or developing a lisp — a significant benefit for your emotional health. Patients who choose dental implants note increased confidence in their smile for years after the process is complete. A traditional denture, by comparison, may slip or slide around at inconvenient times. Non-implant retained replacements often do not look as natural as you might hope, which can leave you feeling like speaking or smiling less. But with dental implants, you can flash your most confident grin at every opportunity. Dental implants actually grow together with the jaw bone for a sturdy foundation that can last for decades. That means dental implants feel comfortable — not only comfortable, but just like your own teeth. This excellent fit eliminates the stress and worry of an ill-fitting prosthetic. Add up all of these emotional benefits of dental implants and you get a significantly improved quality of life! Dental implants offer something other replacement options simply don’t — benefits for your smile, your systemic well-being, AND your emotional health. Don’t hesitate to find out whether you are a candidate for this replacement by getting in touch with your dentist in Sunnyvale this month. Dr. George T. Philip is a general dentist offering comprehensive services, including implant dentistry, for patients in and around Sunnyvale. To learn more about this replacement option, do not hesitate to get in touch with his office by calling 972-285-6144.